Geocaching is the real-world treasure hunt that's happening right now, all around you. There are over two million active geocaches and over six million geocachers worldwide. 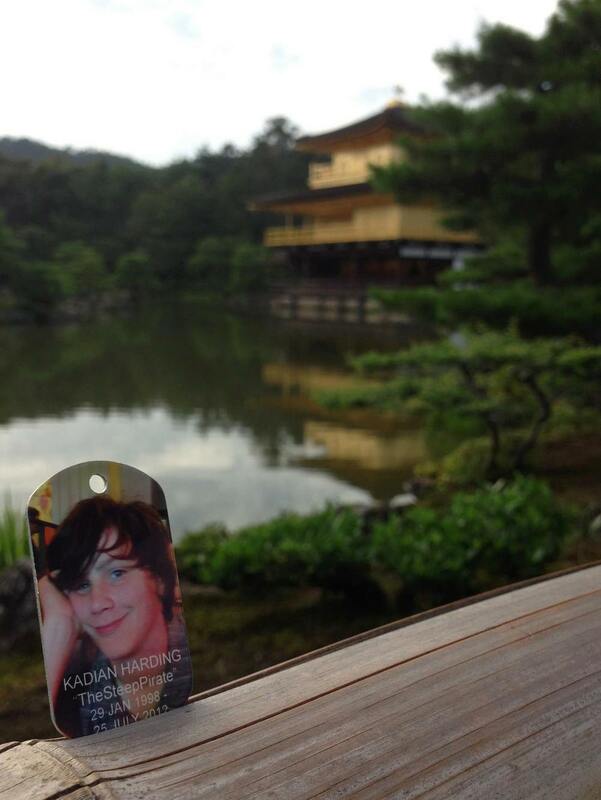 The mission of Kadian’s Geotags is to travel to as many of UNESCO’s designated World Heritage Sites, both Cultural and Areas of Outstanding Beauty, in as many countries, as possible. To find a list of UNESCO sites go here. 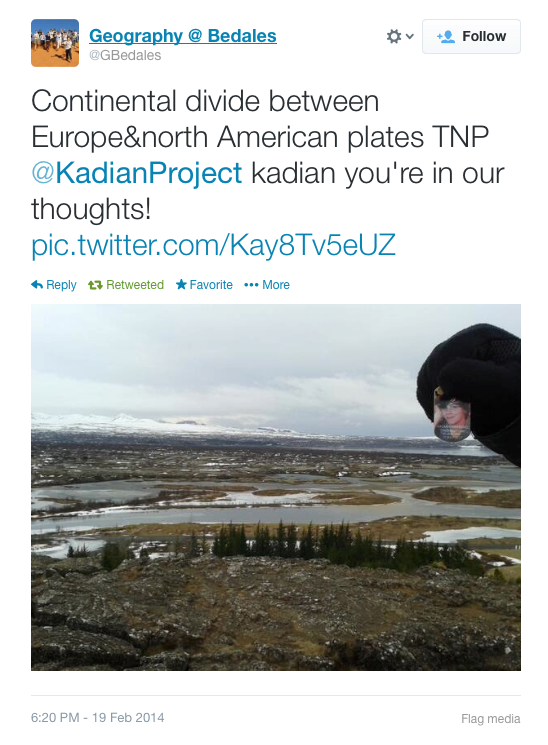 Kadian Geotags have travelled from Antartica, through South American, and through Europe and the UK. We have yet to have one surface in Africa or Asian, but it will happen soon. 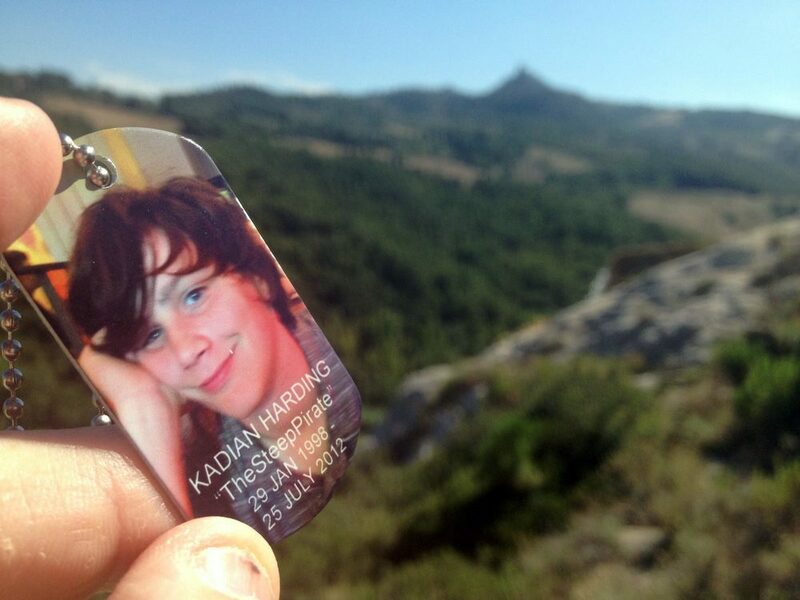 To order a Kadian Geotag go to this website. 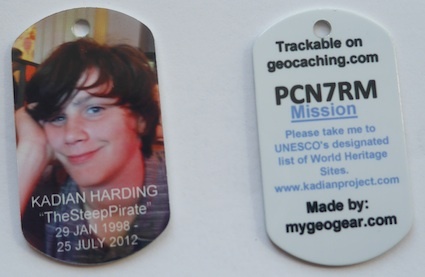 Make sure that you ask for the following trackable mission: "The mission of Kadian’s Geotags is to travel to as many of UNESCO’s designated World Heritage Sites, both Cultural and Areas of Outstanding Beauty, in as many countries, as possible"
Or you can send an email directly to the company that makes the geotags - sales@mygeogear.com - and put 'Kadian Geotag' in the subject line. Scroll below the three “Trackable” boxes until you see a grey box which says “Enter the Tracking Code of the item” Enter the code on the tag starting PC. You will then see a box on the right which says Trackable Options - push Found It! Log It! You will now arrive at a page which says Post A New Log. The first drop down field is called “Type of Log”. You will select, grab it from the current owner. Then leave a comment - like “here we go Kadian! Let’s see where you’ll take us.” Or you can leave a nice memory for someone to read. What ever comment is left, all future geoachers will see.